and out part of the clothes in the garret. The weather was better in the afternoon. Will took me over town. Mother was over all day. Friday November 20th 1891 Agnes told me this morning she wanted to leave and Will went in the country in the afternoon and got the promise of a girl next week. Mother was home all day and done a great deal of the work and I worked on my knit drawers. Hattie was over in the afternoon. It was seven years today since Charlie & Ida were married. Saturday November 21st 1891 It was a rainy night and still raining this morning. John got one load of corn. Will was busy about the place in the afternoon. was in town in the morning. I worked on my drawers all the time I had and got them nearly done. Sunday November 22nd 1891 It was a gloomy cloudy day. I was busy with the work all the forenoon. I wrote to Charlie and read some in the afternoon and Will went over to Marys awhile. I wrote to Vene in the evening. Monday November 23rd 1891 We got up early and though it was still cloudy we washed and put the clothes in the garret. Hatt came over for dinner. I was busy all day getting things fixed to go away tomorrow morning. It cleared of just at night. Will concluded to go with me. 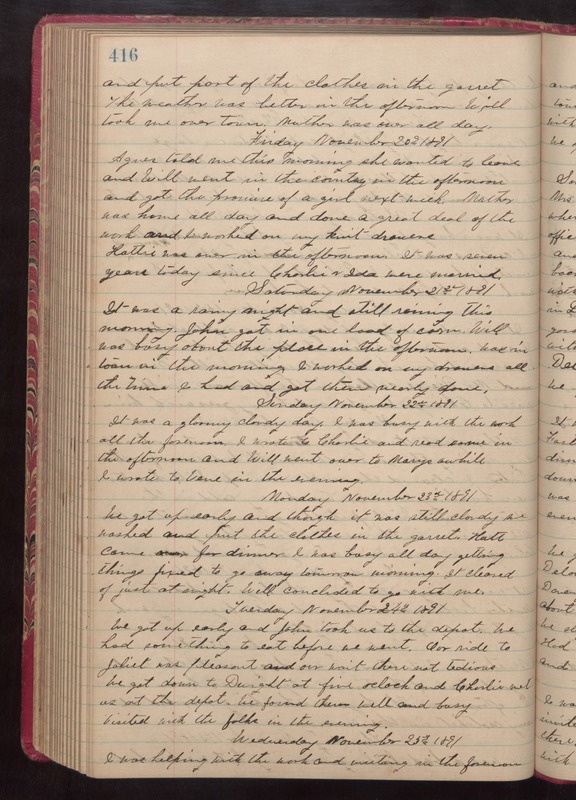 Tuesday Novembner 24th 1891 We got up early and John took us to the depot. We had something to eat before we went. Our ride to Joliet was pleasant and out wait there not tedious. We got down to Dwight at five oclock and Charlie met us at the depot. We found them well and busy. visited with the folks in the evening. Wednesday November 25th 1891 I was helping with the work and visiting in the forenoon.